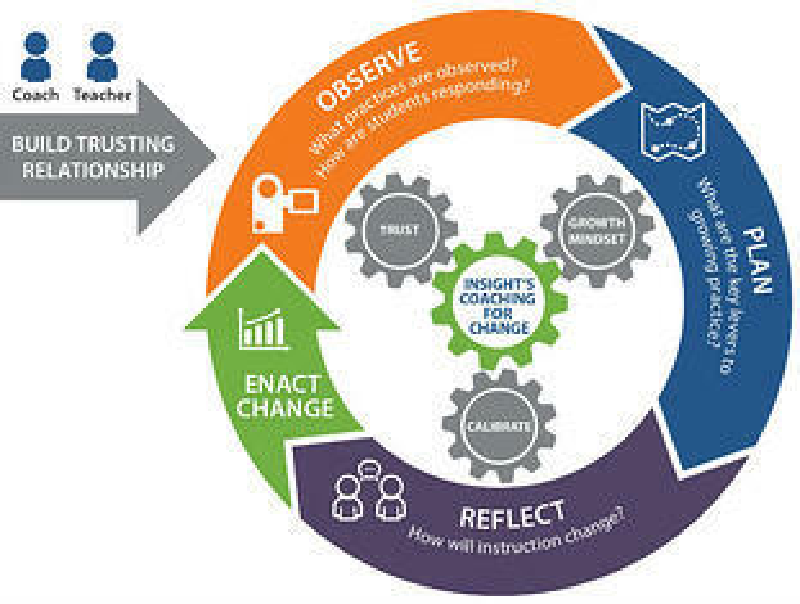 Insight provides content-specific and differentiated coaching for educators that accelerates growth unlike any other form of professional learning. Our results-oriented, job-embedded coaching model called Coaching for Change, ensures that new knowledge and skills translate directly into effective practices for teachers. The model is based on the “reflective practice coaching” model as delineated by the American Institutes of Research (AIR). In addition, it adopts principles and processes from Cognitive Coaching and Insight's Coaching for Change's Practical Guide for Instructional Coaching that combines the best in coaching theory with practical, usable tools for implementing any coaching initiative. Through the Coaching for Change PD workshop, our certified instructional coaches train school leaders and instructional coaches to use reflective questions in order to guide their teachers to high-leverage areas of strength and growth. In the workshop, participants learn how analyzing and discussing key “bright spots” (or areas of strength) in lessons with teachers is intended to help amplify promising practices and transfer them to areas in their practice that require growth. In addition, the workshop provides participants with a variety of skills and strategies to offer a fresh perspective and co-created solutions that push teachers to attain goals, reflect on practices, and celebrate successes. If you're interested in learning more about the workshop, let's talk!